The word coastal invokes feelings of sun, sand and beautiful blue water. Which is why so much of coastal design is rooted in the colors of nature – neutrals, blues, and browns. 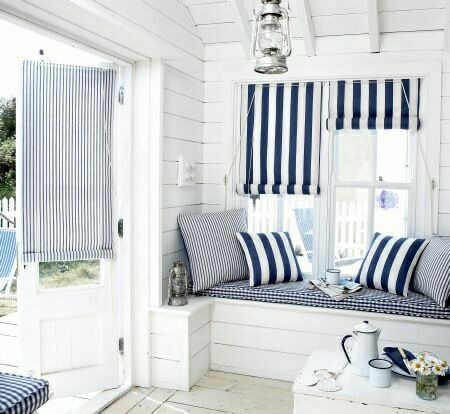 But even if you don’t want to feel like you’re living on the beach, bringing touches of coastal design into your space can make your home more relaxing and inviting. Coastal design, like every other type of design, has been updated. A modern coastal look still includes call outs to the colors and textures of the coast, but it also has black accents, great slim beaded pieces, and deeper blue tones. The old fashioned cottage at the beach always seemed to have an interesting beamed ceiling. The modern coastal homes try to incorporate the beams by painting them white or by leaving them the original rustic color and painting the rest of the paneled ceiling white. One of the things that makes a coastal home so inviting is the mix of textures and patterns. Keep the patterns classic and tonal, and if you worry about mixing patterns, stay in one color palette. For texture, choose some great wicker or beaded light fixtures – or a jute rug or fringy pillows. Coastal doesn’t need to be cozy and warm, like Hygge design, but it should be comfortable. We’d love to put a coastal influenced look together for you at by Design. Our designers can take pieces of the design styles you like and put together a look that is uniquely yours. Stop by and visit us in person – or read more about the different design styles we’ve explored through our Stories and Ideas blog. From California Casual to Farmhouse Modern to Mid Century Modern to New Classic Design Style…we love them all! !